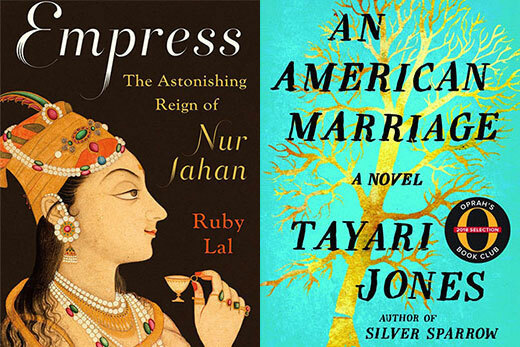 The Los Angeles Times Book Prize has honored Emory professor Ruby Lal’s “Empress” as a finalist in history and professor Tayari Jones’s “An American Marriage” as a finalist in fiction. Winners will be announced April 12. Books published last year by three Emory College of Arts and Sciences faculty members and one PhD alumna have been named finalists for notable awards. The Jewish Book Council named a book co-authored by Eric L. Goldstein, the Judith London Evans Director of the Tam Institute for Jewish Studies, as one of its finalists in the American Jewish Studies category of the 2018 National Jewish Book Award. Goldstein, an associate professor of history and Jewish studies, earned the honor for “On Middle Ground,” with co-author and historian Debora Weiner. Finalists for the 2018 Los Angeles Times Book Prize, meanwhile, include “An American Marriage” by Tayari Jones, professor of English and Creative Writing, in the fiction category and “Empress: The Astonishing Reign of Nur Jahan” by Ruby Lal, professor of South Asian studies, in the history category. Goldstein’s book examines both the formal institutions of Jewish life and the experiences of everyday families in Baltimore, a city whose location as both a border city between the North and the South and a port town created opportunities for immigrants. The National Jewish Book Council announced its winners in January. The council also named a book by an Emory alumna whom Goldstein advised as a finalist in the same category. Samira K. Mehta, who earned her PhD from Emory’s Laney Graduate School in 2013 and was also advised by Goodrich C. White Professor and Chair of Religion Gary M. Laderman, was honored for “Beyond Chrismukkah: The Christian-Jewish Interfaith Family in the United States.” Mehta is now an assistant professor of religious studies at Albright College in Pennsylvania. A New York Times bestseller and 2018 pick for Oprah’s Book Club, Jones’s novel “An American Marriage” tells the story of newlyweds whose pursuit of the American dream is violently interrupted when one of them is incarcerated for a crime he did not commit. Lal’s narrative history of Jahan, the wife of Mughal emperor Jahangir and regarded by historians as the “real power behind the throne” in 14th century India, discusses how influential the empress was in her time and in shaping the country. The LA Times Book Prize finalists were revealed Feb. 20. Winners will be announced April 12 at the LA Times Festival of Books.